Visions of slam dunks danced in their heads . . . Thanks to the community service ethic fostered by our Athletic Department, more than 20 boys and girls from grades three through eight enjoyed several mornings of skill-building and play on the basketball courts in McCalmont Gym and Carey Field House. These clinics were planned and run by the Upper School girls’ and boys’ varsity basketball teams, with encouragement—but no direct involvement—from their coaches, who expect players to give back to the community. In both gyms, the scene was much the same: lanky varsity players leading young boys or girls through sprints and dribbling drills, offensive and defensive plays, sometimes having to kneel on the floor to be at eye-level with their charges. Occasionally, little distractions crept in, resulting in impromptu games of tackle or tickle or Duck, Duck, Goose! The young students and their parents certainly were the immediate beneficiaries—but the blessings went much farther afield. 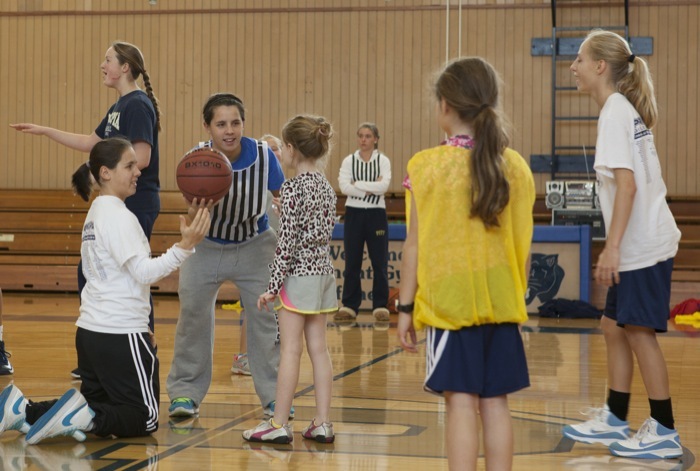 The girls’ clinic charged a small fee, which the team contributed to the Hurricane Sandy relief effort. The boys’ clinic was run at no charge, but they utilized another occasion to raise funds: At the very end of the holiday break, on Sunday, January 6, members of both the girls’ and boys’ teams sponsored a Ballers for Scholars clinic, which raised money to go toward a year of high school education for two young Christian Scientists in rural Kenya. And last, but not least, the varsity players themselves gained a great deal from these events as they practiced planning and organizational skills (as well as patience!) and reinforced their team spirit and camaraderie. Note: Friday, January 11, is a big day for Panther Basketball! Click here to see the packed schedule of home games, one of which will be broadcast live on PIR. The Upper School jazz band and an all-new POMS team will perform that evening.